The San Jose Blog: New Japantown Project Moves Forward! New Japantown Project Moves Forward! 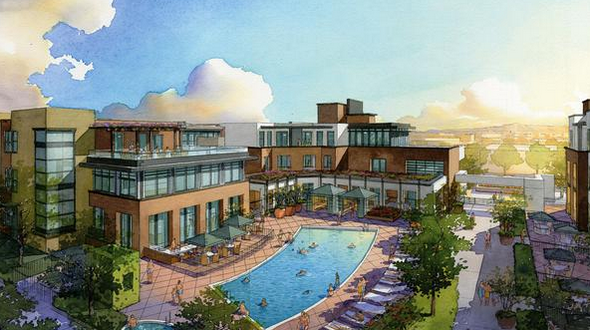 There appears to be no shortage of San Jose projects getting off the ground lately. 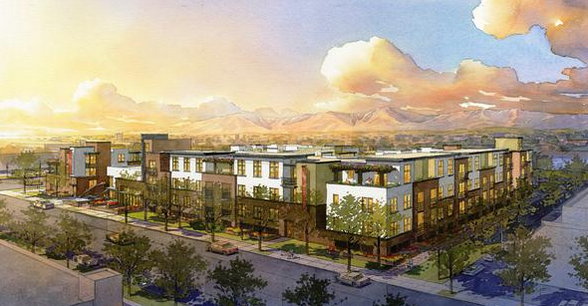 The former La-Z-Boy warehouse is going to transformed into 166 units of luxury apartment living at 825 N. 10th Street. The development will feature studios, 1 bedroom, and 2 bedroom apartments ranging from $1,600 to $2,800 per month. As for amenities, they are shooting for "boutique-hotel living." There will be a nice pool (pictured below), a yoga studio, workout area, and I'm sure much more. Contractors are going to start work immediately on the industrial conversion. Construction should take 17 months with leasing starting in late 2014 or early 2015. There is also work on an 80 unit for-sale project across the street and a major mixed-use project on the city corporation yard with 600 units. I have a feeling we're going to need more than one Bikeshare station in Japantown! Are the existing warehouses going to be torn down or are they going to be converted? It would be awesome if they could re-purpose the existing buildings into the new development. I think there will be some re-purposing. Nope they will be demolished. The existing building isn't interesting at all. It's mostly blank walls. Confirmed on SJPermits: "COMPLETE DEMO OF EXISTING 98,000 SQ FT WAREHOUSE BUILDING & SITE FINISHES FOR FUTURE MULTIFAMILY DEVELOPMENT ." Nice, but not very Japanese-y, eh? To be fair, "Japantown" is mostly Filipino owned businesses, Korean-owned Sushi restaurants and a few Hawaiian stores. Groundbreaking for Centerra, 21 story apartment tower: Thurs. Sept 12 at noon!